This humble backwater fishing village has transformed over recent years to earn the title ‘The Beverly Hills of Bali‘. In Jimbaran you can find the best beaches on the whole coast, a number of high end spas and luxury villas decorating the lush green ridges. You can lounge on the pretty palm fringed bay, delight in the taste of local seafood and peruse the chic boutiques lining the small streets and alleys of this charming, picturesque town. Fish market and the Ulun Siwi temple. White sand and calm waters. Enjoy fresh caught seafood right on the beach. Children friendly beach and easy access to the rest of Bali. Hit the fairways on one of Bukits two golf courses. Surf at Jimbaran shorey. Even better breaks are found further east. Calm warm waters and fine white sands are the key ingredients to the famed beaches of Jimbaran Bay. The beaches here are the safest in Bali and you will often find local children splashing happily in the shallow waters. Spend an afternoon watching the surfers ride the rolling breaks out in the distance. Jimbaran beach is the perfect spot to sit back, relax and admire the bright fishing boats bob on the horizon. Every morning you can breathe in the sights and sounds of the buzzing Jimbaran Market. Here you will find the locals haggling over the catch of the day; it’s a great spot for picking up local produce for that fresh brunch on the beach. There are also plenty of decadent spas to treat yourself to traditional massages, herbal therapies and complete rejuvenation. One thing that can’t be missed is the magnificent sunset painting the sky above Jimbaran Bay. From 5pm be sure to settle in a good spot with a cocktail in hand and enjoy the soft colors streaking the sky. The nightlife is less frantic then other areas. In Jimbaran you can find a style to suit your needs, whether it’s elegant martinis and dinner at the Jimbaran Beach Club or a cheap bar on a deck chair outside the Fish Café. If you are hoping to get your groove on you can often find music and dancing at the Chocolate Café. For the opulent island retreat that offers tranquil tropical waters, fresh daily cuisine and a calm, multicultural nightlife – Jimbaran is top choice for a blend of old Bali with a twist of luxury. Jimbaran is packed with excusive holiday villas, many of them overlooking the bay. 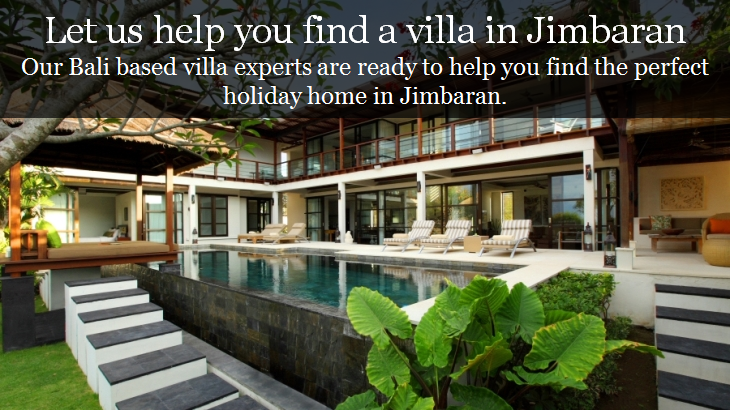 Take a look at all our villas in Jimbaran.